Last night, I dropped off my mod motors with Steve Houle from Speedwerx. With the snocross season opener only a month away, it’s crunch time for getting everything dialed in. At least I know my motors are in good hands! Check out the story about my mod motors at www.arcticinsider.com. The month leading up to Duluth is always a crazy time but I’m confident we’re on schedule to be ready. The semi is wrapped, gear is on the way and the sleds are coming together well. This time of the year is both stressful and exciting because at anytime, day or night, my dad will call me and say, “It’s time to go testing.” Over the years, my dad and I have built a really unique network of people who watch for snow all over Canada and the US, including Alaska. Some of my favorite memories are of test trips with my dad. I have to admit, I’m not always thrilled about the pre-season test trips he decides to take me on. They usually include driving thousands of miles(with no radio) to a remote place that I’ve never heard of and riding in conditions that are less than ideal. It’s not always that bad. Last year, western South Dakota got hit with a snow storm in early November so we were able to test relatively close to home. Sometimes, I’m convinced my dad purposely tries to find somewhere new just for the adventure. He’s way more adventurous than I am and that’s probably why he’s so good at what he does. At the end of the day, I’m fortunate I get to work so closely with my dad and I’m proud to say he’s my crew chief. Until more snow falls, I’ll be busy training on my road bike, mountain bike and dirt bike. I hope to ride my dirt bike this afternoon but need to spend a few hours working on my track first. It’s been raining a lot so my track is really muddy. As long as the rain holds off, I’ll be able to get in some good riding this afternoon. 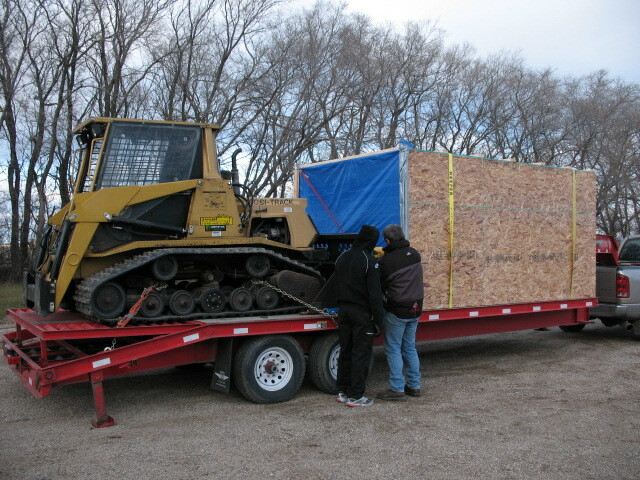 Rob and his dad, Joel, made the “Mobile Test Facility” specifically for the South Dakota test trip. Hopefully it will snow soon so we can load it up again! That’s right everyone, winter has arrived! It snowed for the first time at my house in Northern Minnesota on Friday night. 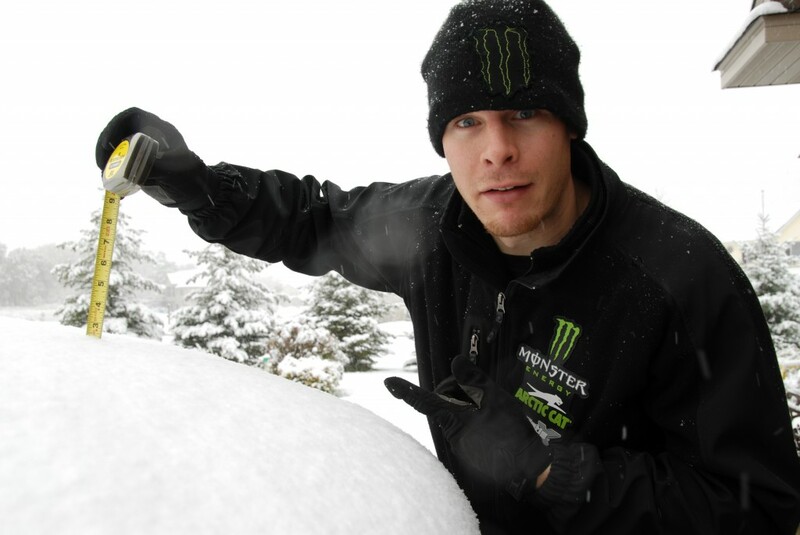 That afternoon, I was riding moto and within a two hour span it went from sunny and warm to a snow storm! We got somewhere between two and three inches. It was snowing and blowing like crazy all night. Saturday morning, I drove to the cities (Minneapolis/St. Paul) and the roads were pure ice. Winter came fast this year. Hopefully everyone is getting excited to ride and are in their local dealerships checking out the new sleds and gear! On Sunday morning, I snuck in a mountain bike ride with my friend John. I rode a new trail in Eagan called Lebanon Hills and had a really good time. Last night, Minneapolis got its first snow. Here’s a picture of me measuring it this morning. Exciting stuff!